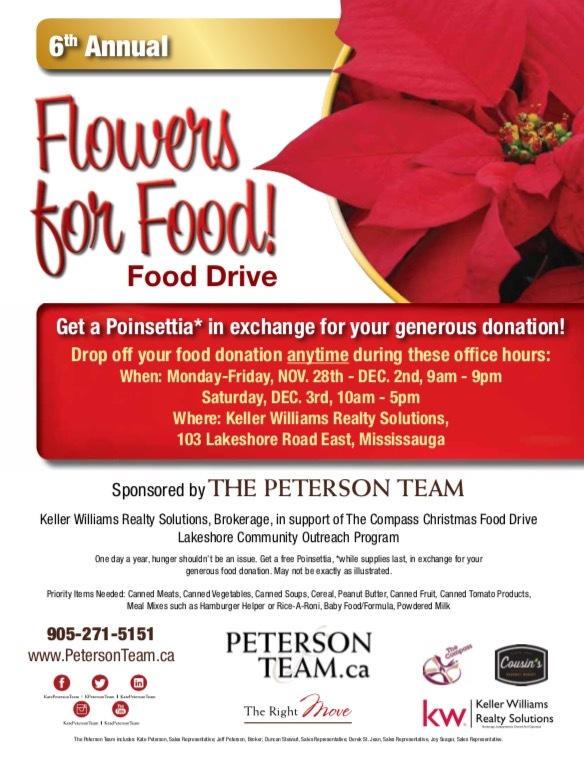 Mississauga, ON – For the sixth year in a row, the Peterson Team is proud to announce its Flowers For Food Event to collect food in support of the Compass Christmas Food Drive. Each year at this time, the Peterson Team hands out free poinsettias in exchange for food donations. This year the event will be held from Monday, November 28th to Saturday, December 3rd at the Keller Williams Realty Solutions office at 103 Lakeshore Road East in Port Credit. Contributors are invited to drop off their donation of non-perishable food items to this location between 9am-9pm Monday-Friday, and 9am-5pm on Saturday. We hope you will help us out with this worthy cause! Located at 310 Lakeshore Road West in Mississauga, The Compass is a community based volunteer organization dedicated to helping those in all walks of life who are experiencing economic, social or emotional challenges. For more information, visit http://www.thecompass.ca. Kate Peterson is one of the founding sales representatives of Keller Williams Realty Solutions of Mississauga. She has been on the Agent Leadership Council at the brokerage and has been a sales representative since 2005 and involved in real estate marketing since 1998. The Peterson Team is comprised of Kate Peterson, Sales Representative, Jeff Peterson, Broker, Duncan Stewart, Sales Representative, Derek St. Jean, Sales Representative, Joy Seager, Sales Representative, Debbie O’Day-Smith, Client Care Manager and Johanna Kee, Admin Manager. Known for its commitment to exceptional personal service and attention to every detail of a real estate transaction, the Peterson Team was in the top 1% of GTA realtors in 2015 based on sales volume statistics from the Toronto Real Estate Board. For more information on the team, please visit http://www.petersonteam.ca/ . Keller Williams Realty Inc. is the largest real estate franchise company in the world by agent count, with more than 152,000 associates around the world. The Keller Williams Realty Solutions franchise opened in February of 2013 and is comprised of more than 140 sales representatives plus a fabulous administrative team. For more information, please visit http://www.kwsolutions.ca/.